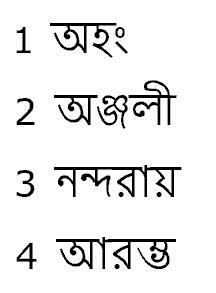 This is indeed the most daunting chapter to teach and this is the toughest lesson for the Bengali studying student. This is the ultimate reason why Devanagari study was recommended. Event though the ultimate conclusion will be made that Bengali’s process of mixing letters is different than Devanagari, the prerequisites of learning how to derive half-letter forms and how to mix accordingly will have a role to play in the next few chapters. Remember, a consonant cluster is a mix of consonants to form one sound. Remember, if two letters are being mix, the first letter always has a virama applied. Normally, I don’t advocate grand memorization unless it is needed. This table is one of the few that will need such memorization. There will be one more table that will require memorization later on. Unfortunately, there is no real way of telling when a half-form is used or not. For example, the “ńa” mixes with the gutturals in a somewhat random fashion. The letter “ńka” is easy to decipher the “ka.” No obvious sign of “ńa” is present. The letter “ńkha” has the “ń” and “kha” which are quite obvious. The letter “ńga” has a form which neither resembles “ńa” and “ga.” To matters more confusing “ńgha” looks like “ńkha”, though there is no real connection between ńa and gha. If one takes the time, one will make patterns for the palatals, cerebrals, dentals (this should be the easiest one), and labials (the most obvious one). As mentioned before, the transliteration scheme is inconvenient, for this is optimal for Sanskrit only. However, as many authoritative academic books use the Sanskrit transliteration for all Indian languages, KKSongs.org resorted to this method, even though there are inaccuracies in spellings. 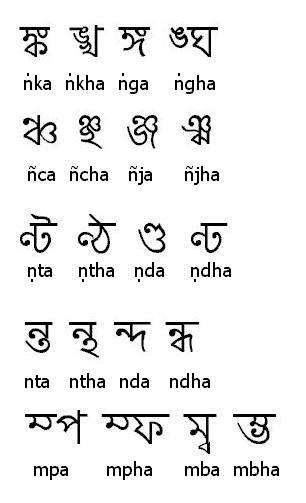 Figure 4.2 shows the two types of anusvāras that is found in the Bengali language. The sound “ḿ” has the same function as Sanskrit, but a very different pronunciation. The “ḿ” letter is pronounced as “ng” in Bengali. For example, the word “evaḿ” is pronounced as “eh-bawng.” “Oḿ” is pronounced “ong.” From the Srimad Bhagavatam, the evil king, “Kaḿsa” is pronounced “kawngsho.” This mark is treated as a letter, even though it is not really a letter. The sound “ń” is not the same thing as the letter “ńa” from the gutturals. The “ń” is a very strong nasal which sounds similar to the Sanskrit “ḿ.” For example, “gaura-cāńda” is pronounced is as “chaand” with the “aa” sound coming from nose. The word “ṣańřa” is pronounced as “shaař” with as strong nasal on the “aa” sound. “The ń is placed on top of the letter.